Tesco is planning to open a number of stores in a mystery new format. The store chain, the country's biggest food retailer, would not comment, but there are strong hints the new-look stores will be aimed at challenging discounters, such as Aldi and Lidl. A whole range of jobs are on offer at new-format stores in Wandsworth, London, Chatteris, Cambridgeshire and Immingham, Lincolnshire. Reports suggest it could be called Jack's, after Tesco founder Jack Cohen. The job adverts, which are headed "Tesco - New Store Format" all contain a line saying: "The new retail format will be operated separately from the core Tesco business and as such benefits offered will be different from those offered at Tesco." 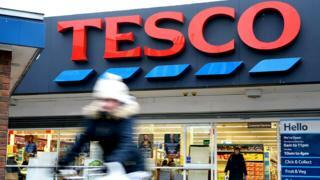 Tesco's move comes as retailers face an increasingly competitive environment. Since their entry into the UK, discount chains Aldi and Lidl have steadily increased their share of the market and now account for 14% of grocery sales. On top of that, internet behemoth Amazon has edged slowly but steadily into food retailing. Last year, Amazon bought upmarket grocer Whole Foods. In the UK, Amazon offers food sales through its Amazon Fresh service, although currently that is still focused on Greater London and parts of the South East. Earlier this month, Tesco announced it was planning a buying partnership with France's Carrefour - a "strategic alliance" whereby the two will try to use their joint buying power to cut costs and offer lower prices to customers. This came after Tesco took over the wholesale giant, Booker. In April, Sainsbury's said that it was in advanced talks to buy Asda from US retail giant Walmart. Some analysts warned any move by Tesco to take on the discounters would need sensitive handling. Thomas Brereton, retail analyst at GlobalData, said: "The possibility of Tesco opening a discount fascia in a bid to neutralise the growing threat posed by German discounters Aldi and Lidl looks a bold move, but orchestrating the emergence of a new brand without damaging the reputation of the main Tesco image will require pinpoint precision to succeed." That point was echoed by Mark Dodds, chairman of the Chartered Institute of Marketing's Food, Drink and Agriculture committee. "Getting the branding balance right will be vital if Tesco is to succeed in taking on the discount supermarkets. If the brand is too different it will have a tough job becoming established in the market," he said. "On the other hand a brand too close to its core runs the risk of cannibalisation of current sales." Last year, Tesco, which employs 440,000 people, reported profits of £1.3bn with sales of £57.5bn.